The president has a rare opportunity to negotiate with a moderate rather than one of Iran's conservative hardliners. President Barack Obama's speech to the United Nations General Assembly in New York on Tuesday is not expected to generate much excitement. Battered by his uneven handling of Syria, no bold foreign policy initiatives are likely. Instead, the undisputed diplomatic rock star of the gathering will be Iran's new President Hassan Rouhani. In his first six weeks in office, the cleric has carried out one of the most aggressive charm offensives in the 34-year history of the Islamic Republic. And the Obama administration responded Thursday, saying the president would be open to having a meeting in New York. If Obama and Rouhani, who will both address the assembly on Tuesday, simply shake hands in public, it will be the seminal event of the gathering's first day. "More than any words he might say, Rouhani's greatest gesture would be shaking hands with President Obama," Karim Sadjadpour, an expert on Iran at the Carnegie Endowment for International Peace, said in an email Thursday. "It would be one of the most significant geopolitical handshakes in years." 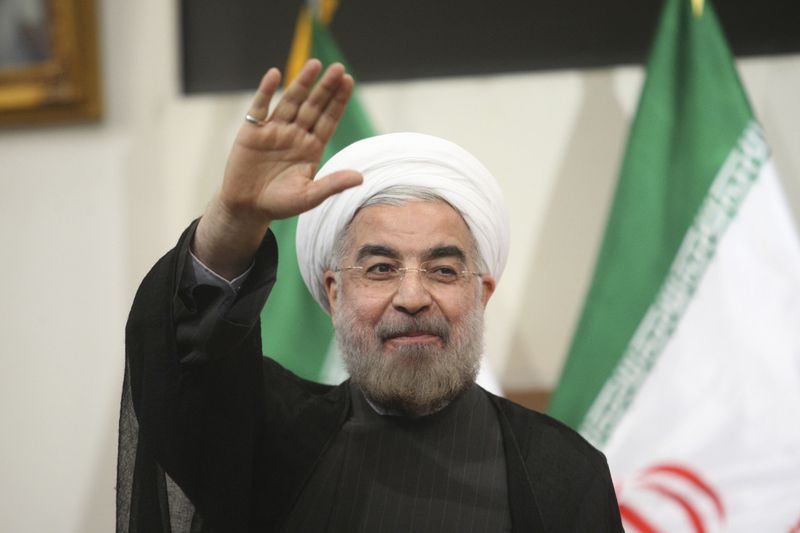 For both Obama and Rouhani, the stakes are high. The war in Syria is metastasizing into a regional Sunni-Shia conflict. A Middle East conflagration could derail a tepid American economic recovery. And sweeping Western sanctions have devastated Iran's economy. Each leader also faces bitter opposition from domestic conservatives--ready to pounce if either president blinks in the three-decade cold war between the two nations. Despite the risks, now is the time for Obama and Rouhani to launch the first direct bilateral negotiations since the 1979 Iranian hostage crisis. From Iran's pursuit of nuclear weapons to the conflict in Syria, the American-Iranian rivalry is helping fuel instability in the region. For Obama, a bold move on Iran would be out of character. After his lurching response to the August 21 sarin gas attack in Syria, critics are declaring Obama's second term listless. A cautious president who focuses largely on domestic issues would have take a major foreign policy risk on talks with Iran, a nation whose leaders have vexed American presidents for decades. To be fair to Obama, the onus for talks to begin lies with Rouhani. For years, Tehran has rejected signals from the George W. Bush and the Obama administration that they wanted direct talks. And despite all the promising rhetoric from the new Iranian leader, it is still unclear what concessions, exactly, Tehran is willing to offer regarding its nuclear program. Obama should keep in place the economic sanctions until a comprehensive agreement is reached that ends Iran's enrichment of uranium. He should begin talks but remain firm. In the long-term, negotiations will aid Obama, even if they fail. As he has argued in Syria, exhausting diplomatic alternatives would make it easier to gain American public support to use force if needed. George Perkovich, a proliferation expert at the Carnegie Endowment, said that the U.S. and Iran should begin bilateral talks focused on a comprehensive agreement on Iran's nuclear program. Talks through the P5 plus 1--the United States, Britain, France, Russia, China and Germany--will, he says, become bogged down. "We should push for a big comprehensive deal as soon as possible," Perkovich said, "rather than the incremental step-by-step approach. Obama doesn't have the political capital to reduce the sanctions step by step, and Rouhani inevitably will lose political capital." Perkovich argued that Rouhani and his new foreign minister, Mohammad Javad Zarif, are moderates who have won support for talks from Iran's Supreme Leader Ayatollah Ali Khamenei--for now. Perkovich, who has met both of the new leaders, says they have concluded it is not in Iran's strategic interest to develop nuclear weapons. "They see that it would totally mobilize the Saudis and everyone else against them," he explained, "and ultimately doesn't benefit them." Skeptics argue that Rouhani, in fact, represents no change in the regime. They say his call for renewed talks in letter exchanges with Obama, an NBC News interview and an Op-Ed in the Washington Post are ploys. They also dismiss the foreign minister's tweeting a Jewish New Year's greeting. Mark P. Lagon and Mark D. Walllace, two former Bush administration officials, believe the new tone is a ruse to give Iran more time to develop a nuclear weapon. "It is imperative that the international community not fall for this trick," they wrote in Foreign Policy last month. "No real change will occur under this theocracy. Cosmetic change is not a reason to give the regime economic relief, and the time it needs to finish its nuclear program." Skepticism is understandable. But given Iranian hardliners' track record of using lethal force to crush uprisings, there is little chance of Khamenei and his Revolutionary Guard backers being toppled. And the debate over striking Syria showed that another American military intervention in the Middle East would be enormously unpopular in the United States. Obama should gamble that Rouhani is what he says--a moderate trying to outflank his country's conservatives. Not rewarding the bold public steps Rouhani has taken will undermine his fleeting authority in Iran. If there is one lesson from Afghanistan and Iraq, it is that American military interventions allow nationalists to blame the U.S. for the plight of their country. Iranian conservatives will use Washington as a foil to bolster their own standing and discredit moderates. Over time, it is far wiser to have Iranian moderates, not Americans, challenge Iran's hardliners. In the end, it will be Iranians who discredit their nation's theocracy, not foreigners.